I purposely did not cover the ignorance that is Robert Zimmerman and his tweets on this site. His racist tweets comparing Trayvon Martin to a suspected murderer of a 13 month old child were so outlandish and didn't warrant getting my blood pressure up. I guess I just take joy in the fact that he's doing more harm to his brother than actually helping him. A racist can't hid his strips no matter how hard he tries. Eventually something racist is going to come out his mouth or rather in this case his Twitter account. 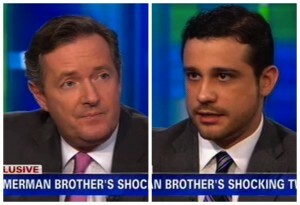 So you can imagine the glee I took in watch Piers Morgan take Zimmerman down a peg or two about his racist attacks against murder victim Trayvon Martin. Morgan found it shocking that he would link this “gruesome” case of a teenager allegedly killing an infant to Martin, who was unarmed when he was shot. Zimmerman told Morgan he was misinterpreting his views, telling him that Martin “chose to portray himself in a certain way.” Morgan interrupted him and told him to explain that point.